The R&S PKU100 Ku-band satellite uplink amplifier combines the best of two worlds in a single device: the unbeatable strengths of solid-state amplifiers and the compactness and low weight of tube amplifiers. 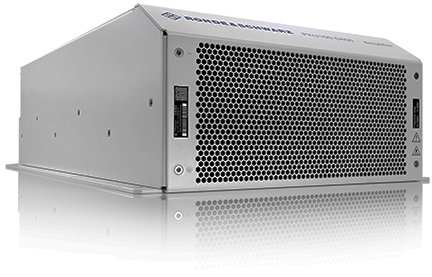 Now Rohde & Schwarz is adding outdoor models to its Ku-band family of amplifiers. The extremely robust and weatherproof models are perfectly suited for outdoor applications and feature all the advantages of the indoor model. 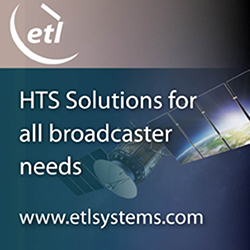 The R&S PKU100 can be used in ground stations and satellite news gathering (SNG) vehicles. Four models of the R&S PKU100 will be available, each in an indoor and an outdoor version. The R&S PKU100 is available for the 12.75 GHz to 13.25 GHz and 13.75 GHz to 14.5 GHz bands with RF peak powers of 400 W and 750 W. The solid-state power amplifier is just as light, compact and energy-efficient as conventional tube amplifiers and therefore clearly superior to comparable solid-state products. The new outdoor models are particularly robust and weatherproof and comply with IP65 ingress protection specifications, plus they offer numerous features required for outdoor applications. The R&S PKU100 can be mounted very close to the transmit antenna, saving RF power and minimizing capital and operating expenses. Same as with the indoor model, the fans can be hot swapped in the event of a failure. If fitted with an optional redundant power supply, the R&S PKU100 will continue operating should one of the power supplies fail. The R&S PKU100 uses solid-state output stages throughout and offers a genuine alternative to conventional tube technology. Should individual transistors fail, for example, the amplifier will continue operating at reduced power. The R&S PKU100 is the only instrument on the market to offer adaptive linearization. This improves signal quality, enabling network operators to transmit significantly more data over the same signal bandwidth. The amplifier offers excellent efficiency, reducing operating costs. The R&S PKU100 can be fitted with a block upconverter (BUC), allowing low-frequency L band signals to be processed and converted to the Ku band. The amplifier can be controlled remotely; it supports all common standards such as a web interface, SNMP, RS 232 and parallel I/O interfaces. The R&S PKU100 will be showcased from September 14 to 18 at IBC 2018 in Amsterdam in hall 7, booth B21. There, a launch event will occur on September 16, at 4:30 p.m.